It's the season for holiday plants, and oftentimes the first ones that come to mind are poinsettias, cyclamen and Christmas cactus. While these plants remain widely available and often are given as gifts, a look around your local florist and garden center can create visions of succulents, tillandsias, orchids and hellebores dancing in your head. Tillandsias are the current darlings of the floral design world. Also known as "air plants," there are more than 500 varieties, all within the bromeliad family. They are available in an astounding array of shapes, sizes and colors. Currently, they are quite popular in glass globes and terrariums; some tiny ones are ready for tree hanging. 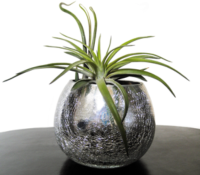 Mist or briefly submerge your tillandsias once a week, but do not leave them in contact with moisture. Succulents are appearing everywhere, from bridal centerpieces to showcase gardens, and are available in a staggering range of shapes and sizes. They also can be used in wreaths and floral arrangements. The plants, however, do not like sitting in moisture. Enjoy them in your gift arrangement, then plant them in fast-draining soil (cactus mix comes in bags at garden centers) in regular sunlight. If you're an apartment dweller with no sunny window, don't be shy about re-gifting your succulents to a friend with sunny outdoor space. Hellebores also can land on many holiday gift lists. 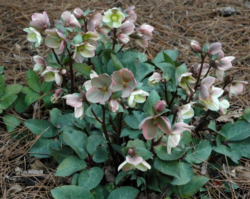 Commonly referred to as Christmas or Lenten roses (Helleborus niger or black hellebore), these easy-to-care-for plants are becoming increasingly popular, and for good reason. Their leathery evergreen leaves and lovely flowers make attractive houseplants and can be transitioned into the outside for a lifetime. They thrive in partial to full shade, with good air circulation and well-drained soil amended with compost or organic matter. As an added bonus, they are not tasty to deer. 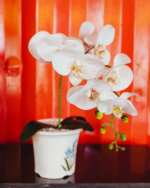 Orchids, especially the Phalaenopsis or moth orchid, are gift plants with amazing longevity and are available in multiple colors and bloom sizes. Finding the perfect location in your home, removed from heat vents and direct sunlight, is critical to extending the bloom period. Water your plant "weakly weekly.” Once a week, water with half-strength orchid fertilizer, allowing the water to flow through the pot. Do not leave the plant sitting in a puddle. Traditional holiday plants such as poinsettias, cyclamen and Christmas cactus may be coming your way this holiday season. When they arrive, it's worth remembering that wet roots are taboo so get rid of that shiny foil. It inhibits drainage. They also do not tolerate drafts from a fireplace or furnace vents. Both the poinsettia and the Christmas cactus should be watered when the surface is dry to the touch. Cyclamen prefer to be kept moist and can wilt quickly. Water at the soil level, but keep moisture away from the area on the tuber where the leaf and flower stems grow because this may cause the plant to rot. Selecting a healthy poinsettia is key to prolonging its beauty. Examine the cyathia, the little yellow or green berries in the center of the bracts. If they are tight, the plant is fresh. Choose stiff stems and good bract retention. Be wary of plants displayed in paper or other sleeves and crowded together. They need space and crowding can cause problems. Keep plants indoors at 68 to70 degrees and place in indirect sunlight for at least six hours a day. water when the soil feels dry to the touch and fertilize after the blooming season with a balanced all-purpose fertilizer. Don’t over water, and don’t fertilize when in bloom. With proper care, dedication and luck you can re-bloom this year’s poinsettia. In late March or early April cut it back to eight inches and place in a warm but shady place. Water regularly and feed with a balanced fertilizer to see new growth by the end of May. In the summer repot in new soil that includes sand and peat moss. When there is no chance of frost, place outside in full sun and keep soil evenly moist and feed every two to three weeks. 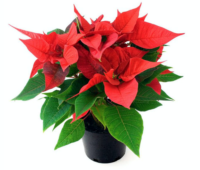 Poinsettias are photoperiodic, so on the first of October plants must be kept in total darkness for 14 continuous hours each night at 68 to 70 degrees of temperature. During the day they need 6-8 hours of sunshine. Continue to give regular water and feedings for the next 8-10 weeks to get blooms for the holiday. 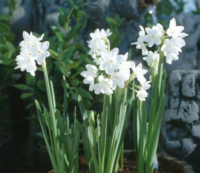 Paper white narcissus will fill your home with fragrance and bloom. These bulbs are easily forced in soil, gravel or sand – that is, you don’t need to plant them in soil for them to bloom. Enjoy paper whites while they’re in bloom, then compost them. 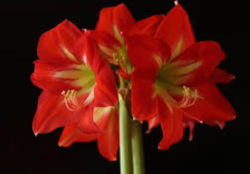 Amaryllis are also easy to grow, traditional flowering gift plants. After enjoying their long bloom period, they can easily become a part of your landscape. 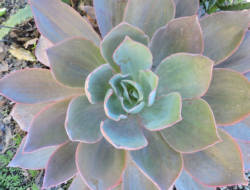 While it is possible to encourage them to re-bloom at holiday time, it is much easier to allow them to acclimate to your garden and bloom on their own timetable. Here’s more information on these striking holiday beauties. Here's wishing you a happy holiday season filled with bulbs, corms, annuals, perennials and a wide array of flowering plants.